2) Have a Mind That is Open to Everything and Attached to Nothing. 3) You Can’t Give Away What You Don’t Have. 5) Give Up Your Personal History. 6) You Can’t Solve a Problem with the Same Mind that Created It. 7) There Are No Justified Resentments. 8) Treat Yourself as if You Already Are What You’d Like to Be. 10) Wisdom is Avoiding All Thoughts that Weaken You. 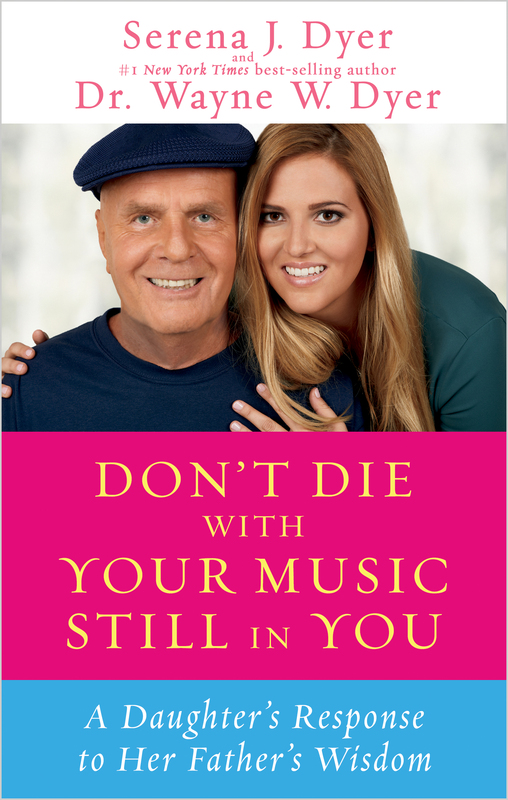 Personally, I am always inspired by Wayne Dyer, but don’t always find it easy to take his advice and just live it, even when I totally agree, e.g., that negative thinking or resentment weaken you. I know that to be true, but oh, we are all so human and full of ego at times! So I was very interested to see if growing up in the household of this spiritual teacher made it that much easier. Serena Dyer’s account of life with two spiritual parents was enlightening as well as very interesting… lifting the curtain on a family that had spirituality as its guiding light, but difficulties with relationships and health as well. She explains how she learned the 10 secrets as part of her daily life, how she failed at using these secrets at times, and examples of situations that helped her embrace them. Dr. Dyer sums up each chapter commenting on Serena’s writing and learning, adding additional food for thought on each of the topics. The lessons shared in the book which most inspired me were trusting your own intuition, surrendering bad feelings and handing them over to God, manifesting your dreams, showing gratitude that everything is in Divine order, and knowing that God does not exist outside of us, but within us. A big lesson that Serena says she learned as she doubted her path in the world, was that loving herself and accepting her life exactly as it was, led it to change for the better. No matter who you are, or who your parents are, you may need to be reminded to bless the present, trust yourself and expect the best. “I am trying to be more like my parents, but it’s not always easy for me,” she writes. We’re all on a journey to fulfill our life’s purpose, hopefully finding success and inner peace, and it’s not always easy. So, the guidance offered by Wayne Dyer, with its interpretation by Serena, makes it that much more accessible. BECCA: Despite the benefits, did you feel any particular pressure growing up as the daughter of a famous spiritual guru? SERENA: When I was a child, I was not aware that my dad was famous, in fact, it still seems weird for me to write or acknowledge that he is to this day! Being one of 8 children, I was really unaware of any outside perception of myself or my family, I was mostly concerned with getting my siblings to laugh or be goofy with them. I write that because in terms of “pressure” I felt more pressure to get along with the pack of siblings that we were and really felt no pressure at all from my parents. BECCA: Your own learning curve in embodying your father’s teaching gives us all hope that, with practice, we can achieve our goals. Did you find any one of the 10 Secrets for Success and Inner Peace hardest to apply? SERENA: There were definitely a few secrets that have been more difficult for me and continue to be more difficult for me to this day. Embracing silence is one; I enjoy being distracted and constantly find myself having to battle with putting my phone down and not getting too caught up in social media. It is a struggle for me! BECCA: In my experience, judgment and resentment are so very hard for people to relinquish. What did you learn about them that can help the reader the most? SERENA: I heard a line about judgement and resentment and I think it so perfectly sums up the importance of relinquishing these feelings: hanging on to anger is like drinking poison and expecting the other person to die. Judging people or staying attached to feelings of resentment only harms you, and keeps you more aligned with the energy of anger and resentment that you probably want to get away from. If you want to feel good, and who doesn’t, then you must abandon the thoughts you hold on to that make you feel bad! It is as simple as that! Serena shares more inspiration at www.serenadyer.com. Thanks to Becca for such a thought-provoking and evergreen blog thread. I have been reading Wayne Dyer’s advice since I was but a wee lad, and am glad to read that his progeny are following,in his footsteps. Me: framing my to-do list today and everyday will be Selena’s guidance on expressing my inner genius.